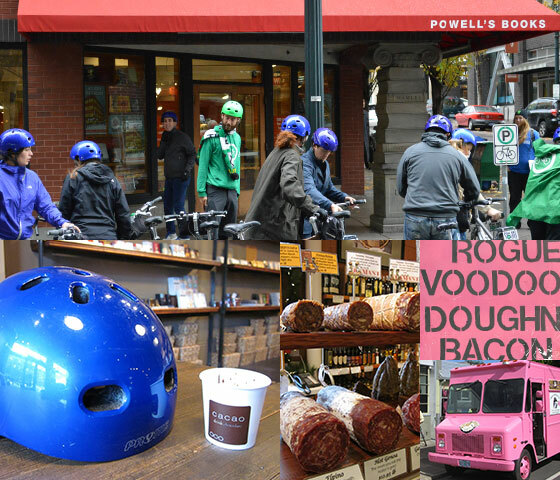 Experience Portland like a local! 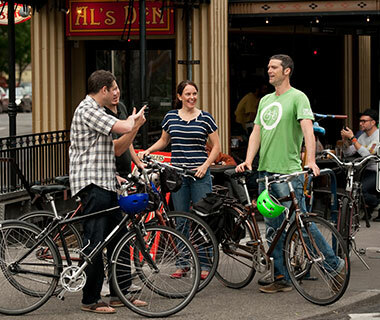 Hop on a bike for an easy, fun and safe spin through the city’s history, food, and architecture. 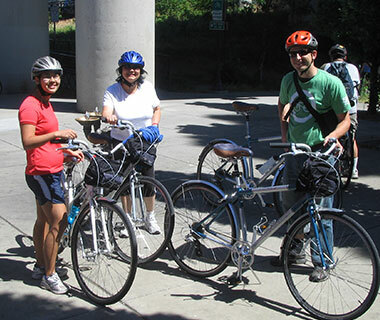 We offer guided tours that highlight unique attributes and interesting neighborhoods, as well as bicycle rentals. Choose a guided tour and get ready to saddle up! 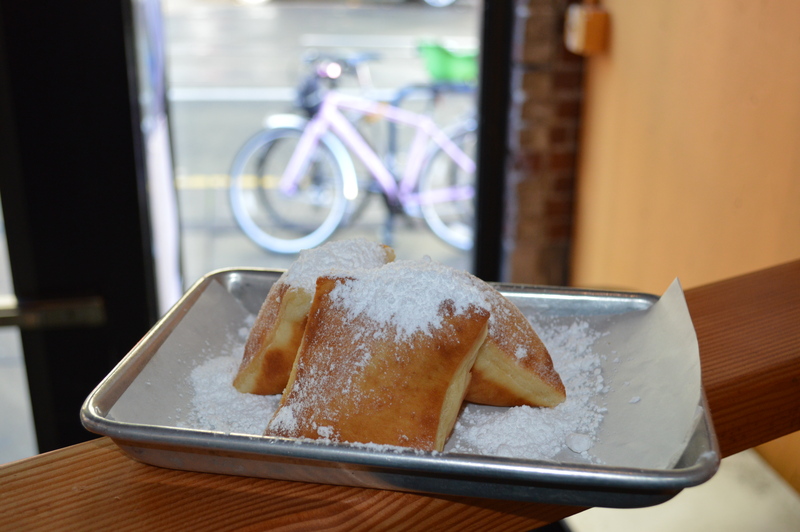 The essential introduction to Portland. 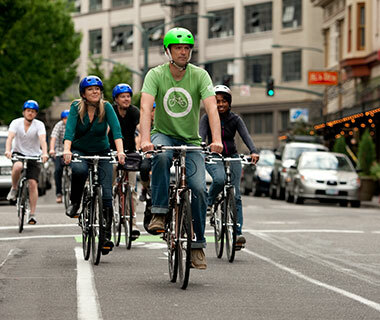 We’ll hop on well-traveled bike lanes stopping to admire the views of downtown, the river and the city’s many bridges. Then we ride along the waterfront past the brick and cast iron fronted buildings of Old Town built in the 19th and early 20th century. Next our tour will head into Chinatown where the streets once teemed with immigrants from all over the world. 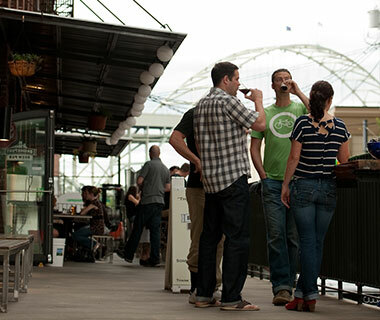 From there we’ll roll through the Pearl District where turn-of-the-century warehouses have been turned into art galleries, shops and restaurants surrounded by soaring glass residences. Our tour stops at several of the Pearl’s most interesting places! We’ll pass Henry Weinhard’s 140 year old brewery and a fortress-like armory turned theater before pointing our handlebars south to downtown. The tour cruises past a number of our favorite food carts before entering the South Park Blocks – separated from the North blocks by a century of legal battles. 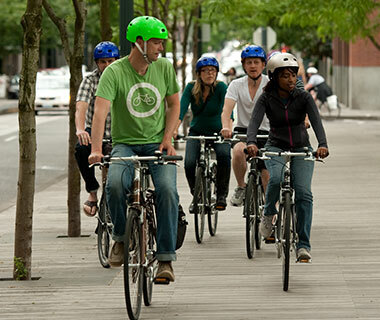 We’ll pedal through Oregon’s largest university then turn downhill to the waterfront and the Willamette River, lifeblood of the city and state. Finally we’ll ride downriver on car-free paths before coming full circle back where we started, perfectly energized. 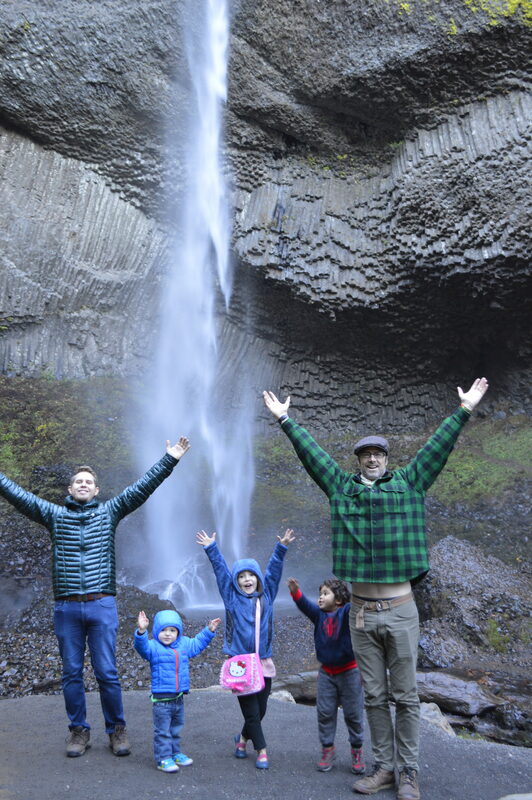 Jump into our van and drive to scenic vistas of the Columbia Gorge, then ride 6 miles & stop at several waterfalls for short hikes amid ferns, trees & cool mists. 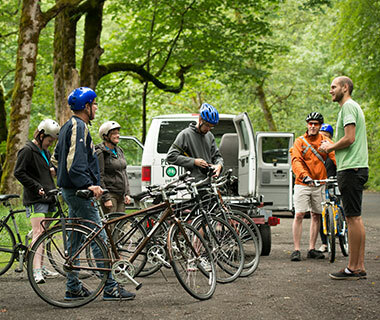 To begin this combination bike and hike excursion (bike and helmet are included in the tour price) we’ll jump into the Pedal Bike Tours van and drive 1 hour to the Historic Columbia River Highway, completed in 1916. On the way we’ll view some of the most photographed scenic vistas in the Gorge before unloading the bikes for our ride. Guests ride alone, meandering along the old highway while the guide provides back-up with the van. 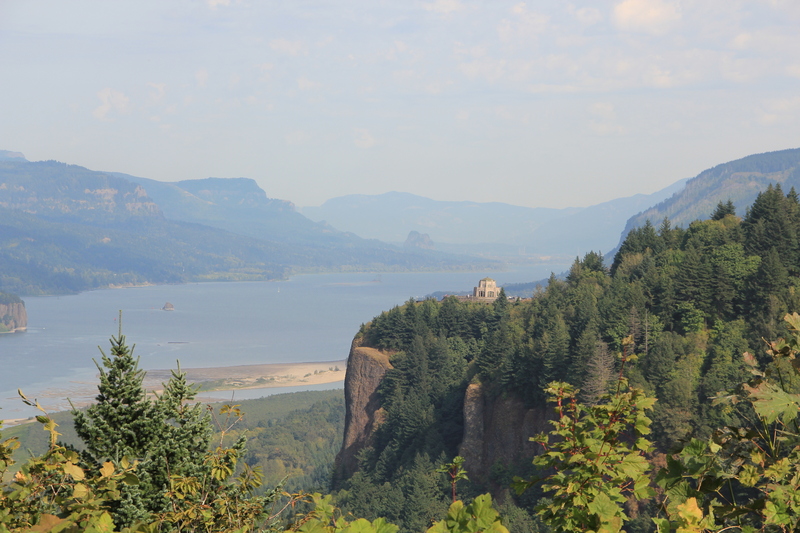 This 5-mile ride gives us a sense of what it was like to travel along the first National Scenic Highway in the nation through the Gorge before construction of the interstate highway. 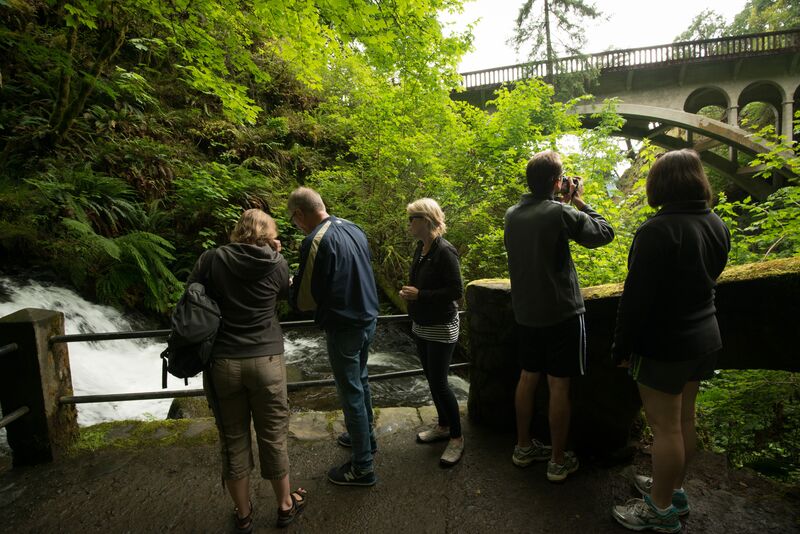 We’ll stop at several waterfalls for short hikes to where you can feel the cool mist of water and the pulsing concussion of air from the falls amidst the lush green growth of dozens of species of trees, flowering shrubs, ferns, and moss. We may even glimpse some of the native birds of prey, such as osprey and bald eagles. 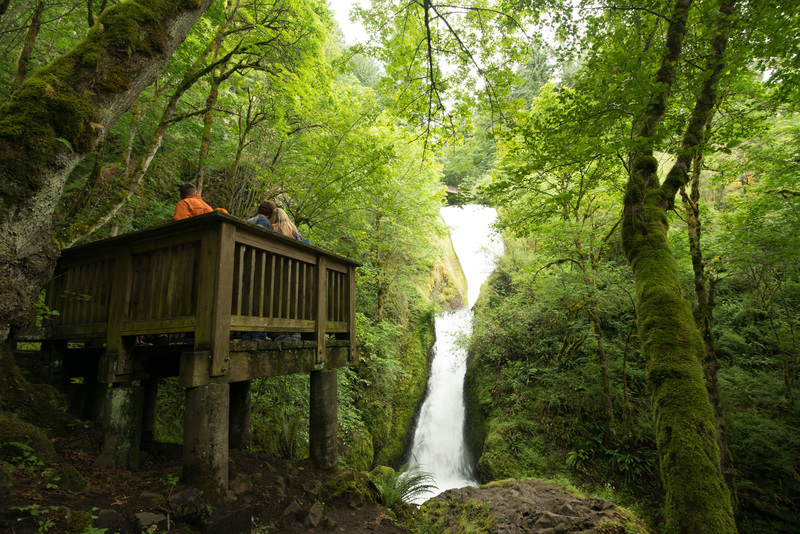 After exploring the falls and six miles of the Historic Columbia River Highway, relax as we transport you back to the city to complete your experience of one of the most beautiful places in Oregon. 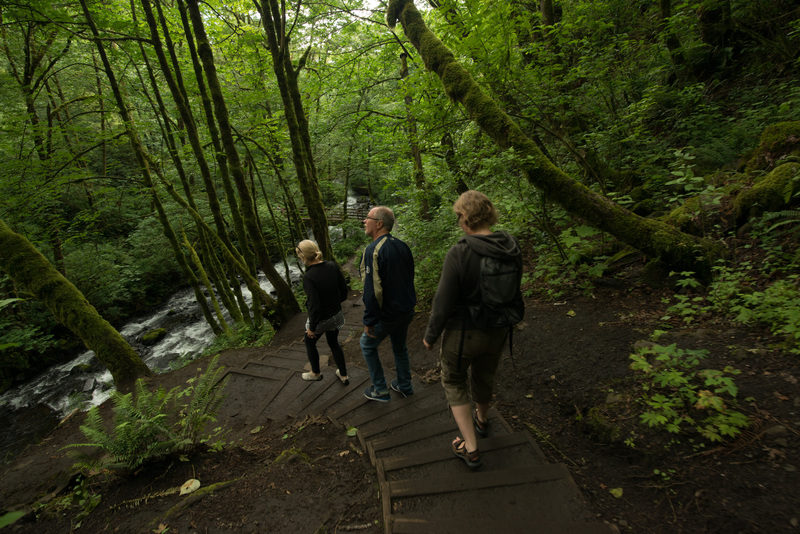 We’ll drive 30 minutes to scenic vistas of the Columbia Gorge where we’ll explore two waterfalls for short hikes amid lush greenery and stunning cliffs. 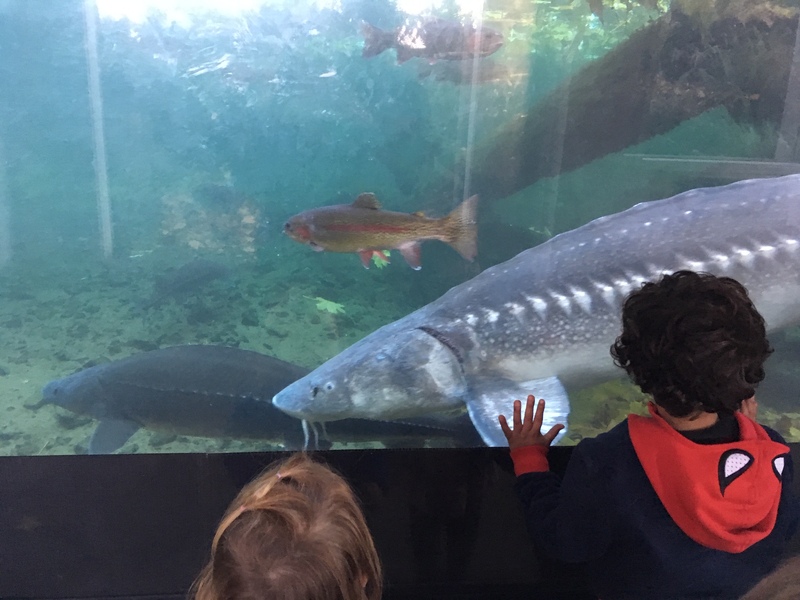 Then, visit a fish hatchery full of pools of salmon and a 10 foot long sturgeon. 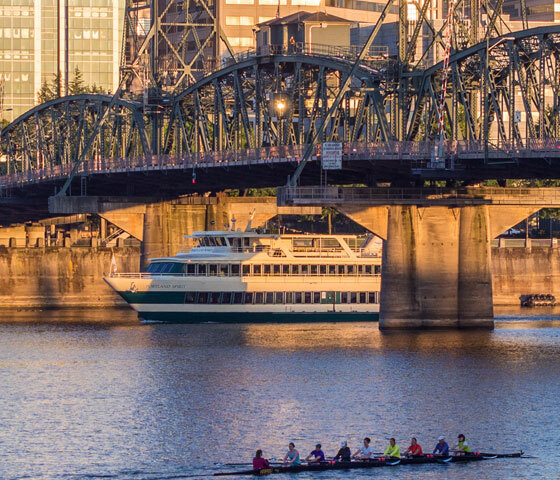 Immerse yourself in Oregon’s lush wilderness, and experience first-hand the raw power of the country’s second largest waterway – the Columbia River. Experience the sheer cliffs, towering trees, cascading waterfalls, and massive lava formations left behind by one of the earth’s most powerful geological cataclysms. 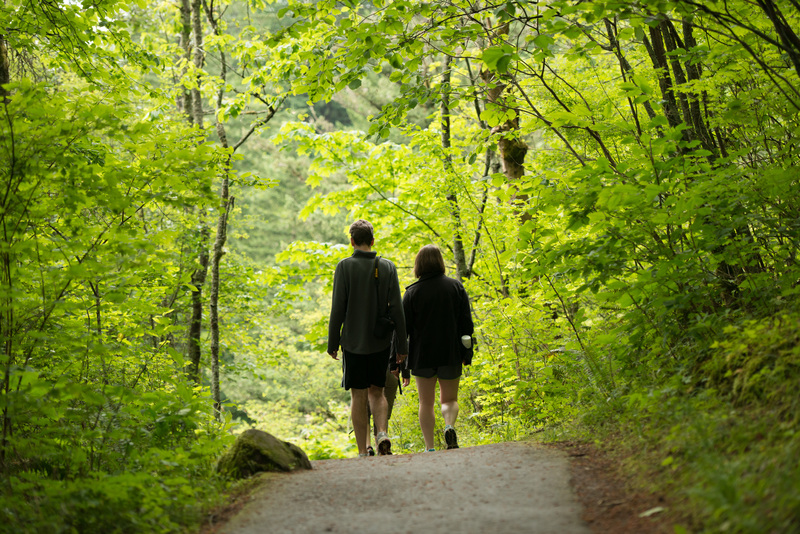 And to think, this combination drive and hike adventure begins just 30 minutes outside of Portland and is perfect for nearly all ages and fitness levels. 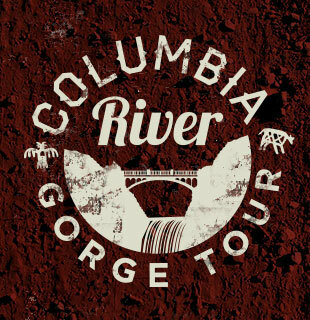 To transport you to this wild wonder, we’ll jump into the van and meander along the country’s first national scenic road, the Historic Columbia River Highway completed in 1916. 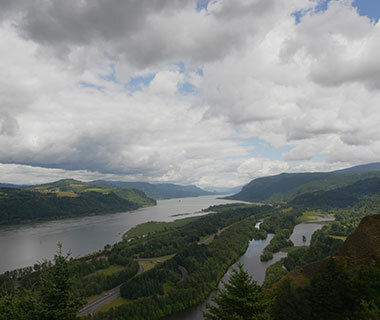 On the way we’ll stop at some of the most sweeping scenic vistas in the Gorge, where we’ll soak up the grandeur and take unforgettable photos. The drive gives us a sense of what it was like to travel by car 100 years ago, into the impenetrable gorge. On the way we’ll pass several impressive waterfalls, stopping for a 1/4 mile hike at Latourell falls and 2/3 of a mile hike at Bridal Veil Falls where we’ll soak up the cool mists and feel the powerful crash of the water as it hits the rocks amid the lush green of dozens of species of trees, flowering shrubs, ferns, and moss. 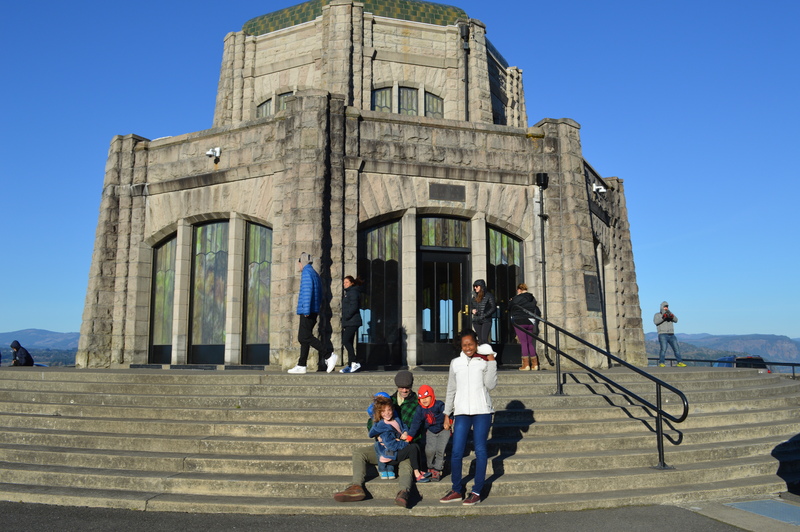 After getting our steps in, we’ll hop back into the van and head to stunning Multnomah Falls, where we’ll walk to the Benson Bridge and look up at the 600 foot fall. Here we can admire the beautiful stone craftsmanship of the depression-era Multnomah Falls Lodge. Next, we continue toward the Bonneville Dam, stopping at the adjoining fish hatchery. 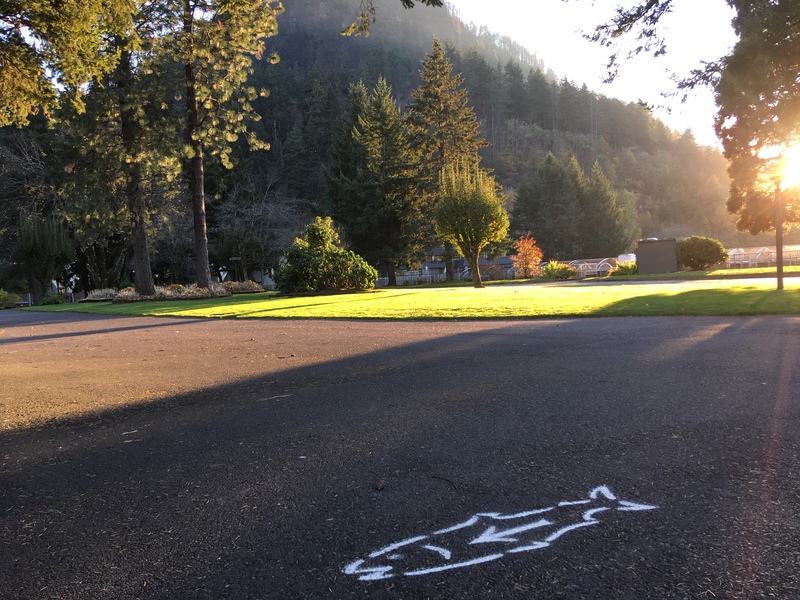 There we can see several prehistoric giants – 10 foot long sturgeons – which still today ply the bottom of the Columbia River by the thousands. And finally, relax as we drive you back to the city, taking in the wide angle views of the gorge on the highway, completing your experience of one of the most beautiful places in Oregon. 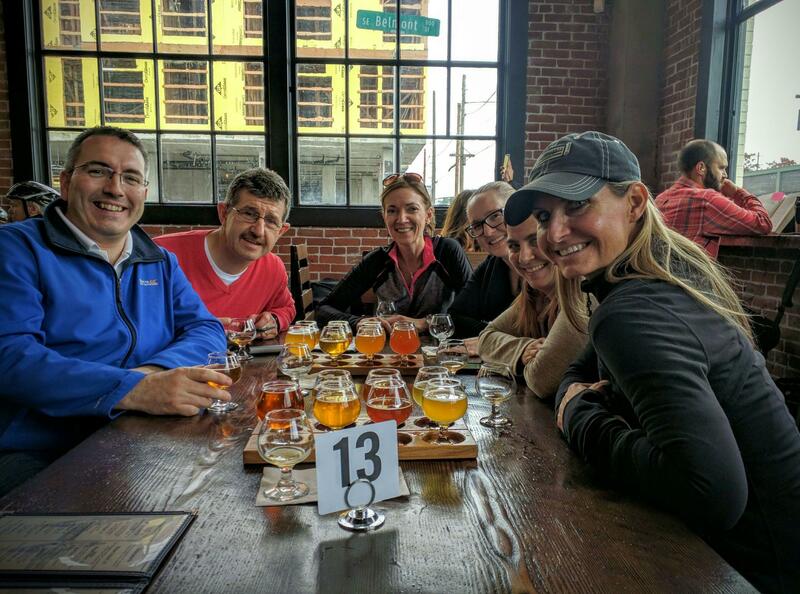 Take a leisurely ride with Pedal Bike Tours to see several of the 40 microbreweries and brewpubs that make Portland “Beervana” and get to know America’s bicycle capital like a local! 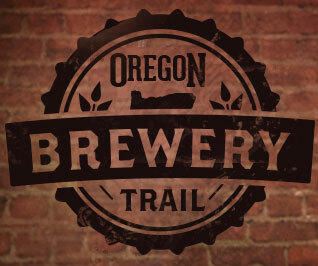 Work up your thirst with this fun and easy paced 3 hour, 5 mile tour past many of Oregon’s best loved breweries. Includes beer from 3 breweries, with a bonus beer from the shop keg after the tour! We’ll even tour one of the breweries and see how the magic is made! Along the way we’ll point out all the best bars, restaurants and many Portland sights and crossing the river twice on 2 bridges. We’ll ride past 5 local brewpubs, learn about what makes them icons, stop into 3 of them for samples, and finish the tour with a glass of tasty, local brew at our shop. 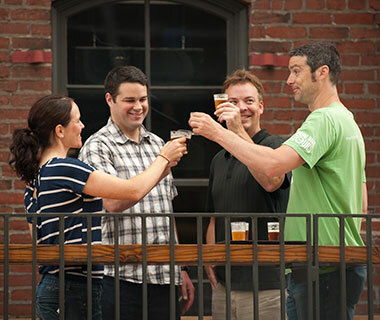 You’ll leave the tour with plenty of ideas of places to check out to so that you can continue exploring Brewvana and enjoying the best beer in Oregon! 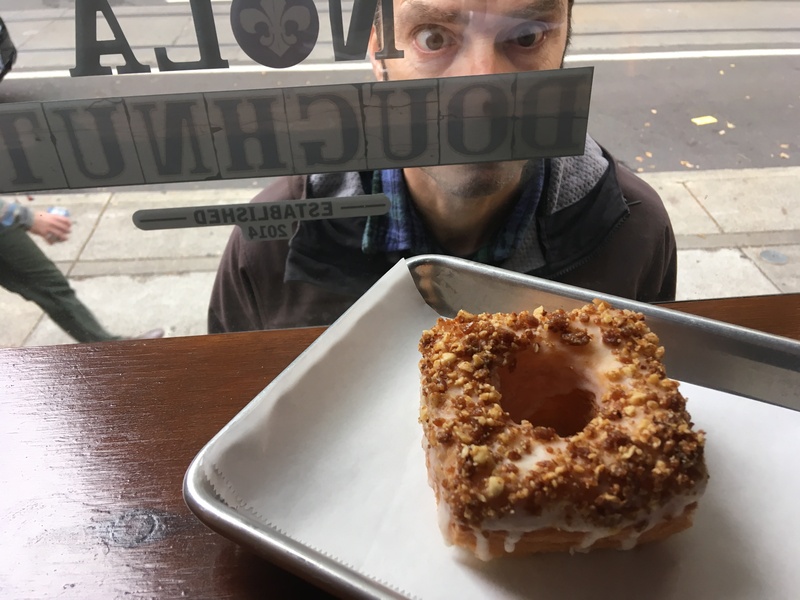 Skip the hour long line at Voodoo and ride with us to some of the city’s most famous donut shops for a taste of Portland’s most delicious doughy delights – all food included! 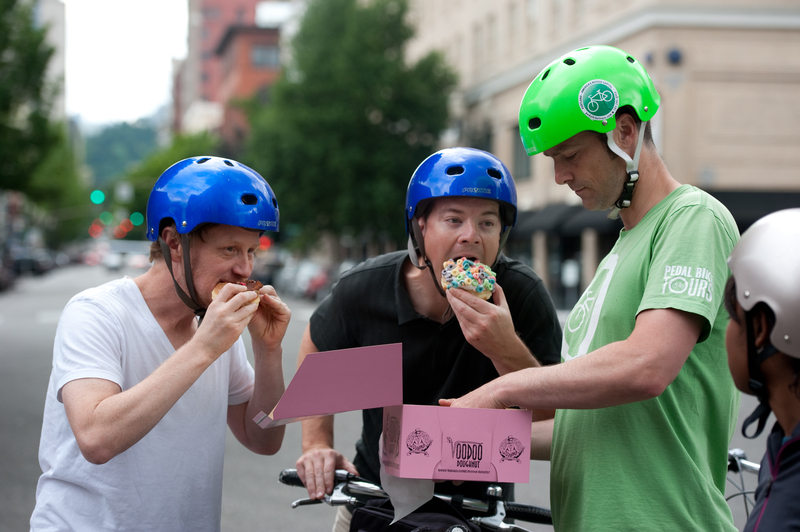 We’ll cruise between 4 donut shops and ride through several of Portland’s most lively and iconic neighborhoods. 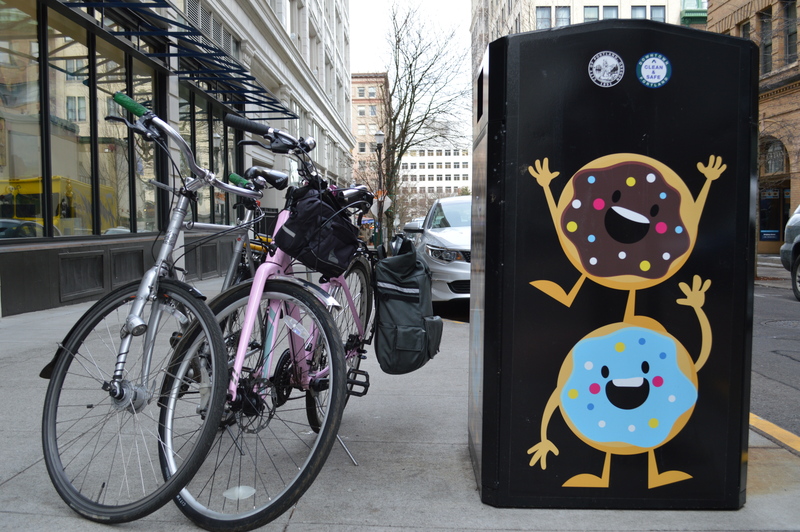 This 2 1/2 hour 4 mile tour takes you to some of the city’s most famous donut shops for a taste of Portland’s most delicious doughy delights – all food included! 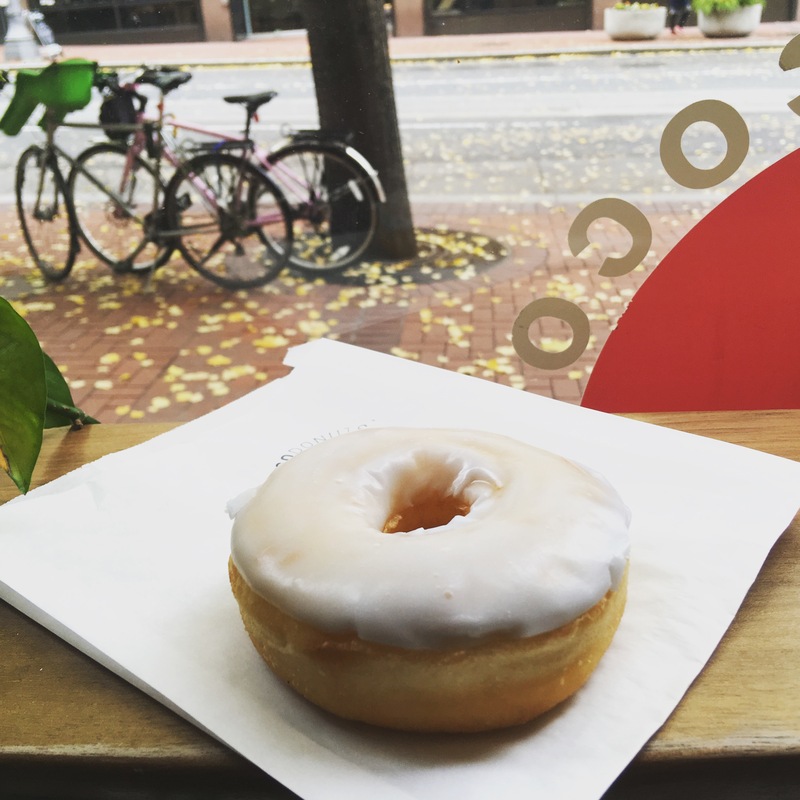 We’ll cruise between 4 donut shops and ride through several of Portland’s most lively and iconic neighborhoods including Old Town, Chinatown, the Pearl District, the Park Blocks, Portland State University and the scenic Portland Waterfront. Our first stop is NOLA with their rich, chocolaty layered La’ssant. 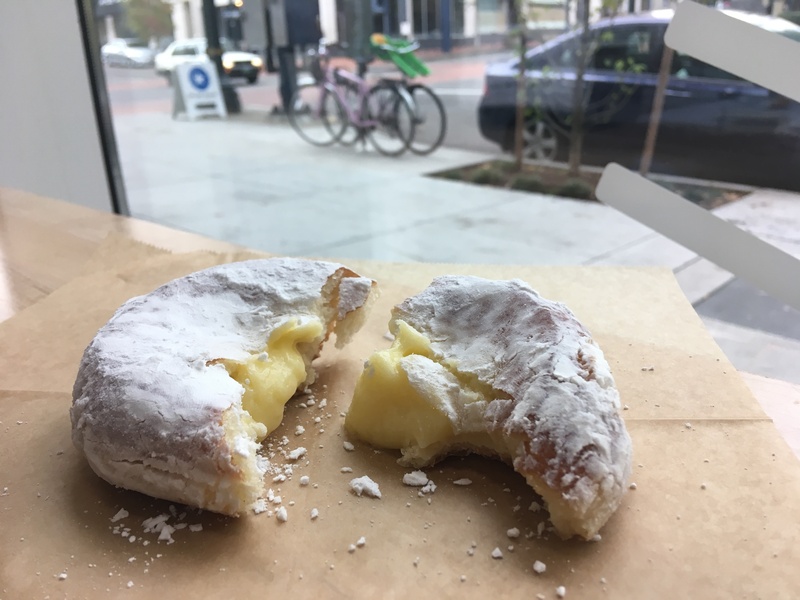 The next is the deservedly famous Blue Star, where we’ll sample the French brioche-based doughnut that graced the cover of Food & Wine magazine. Then on we go to local favorite Coco Donuts, which not only has scrumptious donuts but also roasts their own coffee. 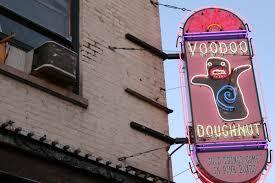 Then we cruise down the hill, along the river and to the most famous place in Portland, Voodoo donuts where we’ll skip the line (often an hour long!) and try the notoriously delicious bacon maple bar (vegetarian option available). 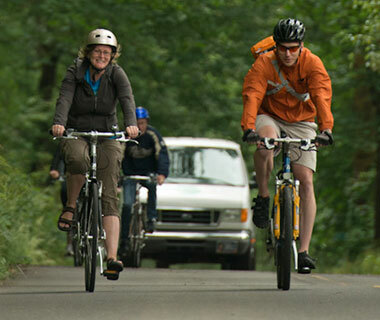 See Portland from all sides with this unique Bike & Boat tour package. Normally valued starting at $93. 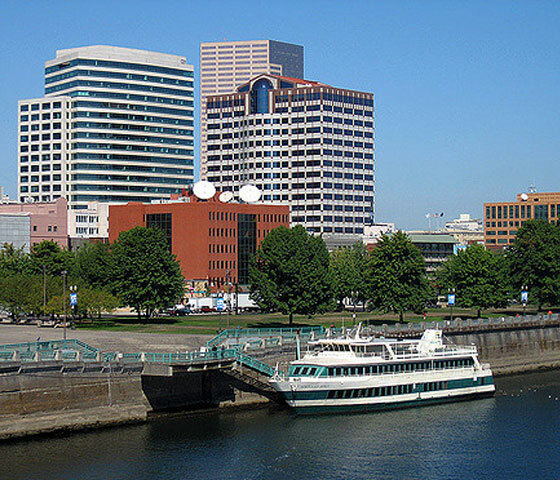 This complete Portland touring experience includes a Sightseeing Cruise with Portland Spirit Cruises & Events and an Historic Downtown Bike Tour from Pedal Bike Tours for only $70. 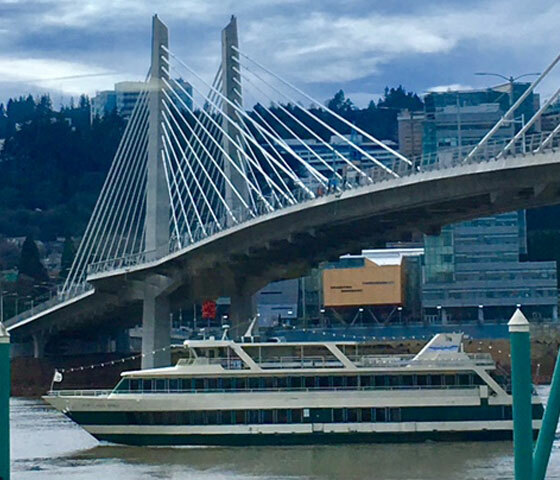 Boarding downtown at the Salmon Springs Fountain, Enjoy the sights along the Willamette River aboard the Portland Spirit as you take in the Portland skyline and our unique bridges. Enjoy our Captains Narration on the Starlight deck as you learn more about the history and sights of our wonderful and “weird” city. Full service bars available on all three decks. Be sure to visit the wheel house and gift shop. 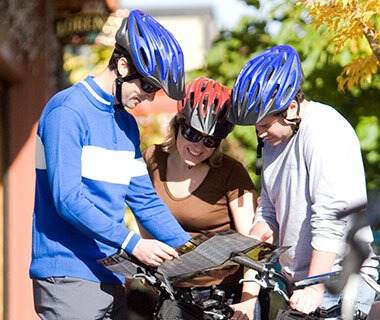 Once you recieve your cruise confirmation and booking number, you will need to call Pedal Bike Tours 503-243-2453 to schedule your bike tour. Please provide your name and booking number when booking your bike tour. 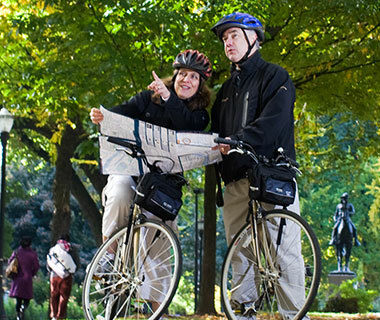 Your bike tour must be scheduled for a time within 3 days of your cruise. Want something a little different? We live for new tours! If you haven’t found the tour you’re looking for on our website, let us know and we can design a custom bike tour just for you. 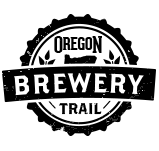 Want to tour coffee roasters? Sure! Urban wineries? Absolutely! Volcanoes? Got ’em! Tattoo parlors? Come this way! Want more miles? Yes! Want to visit a donut shop, bookstore, dive bar, vintage bridal shop and the best happy hour? Done! Teambuilding? Right on! We’re happy to customize any of our established tours or we can plan something completely different based on your interests. 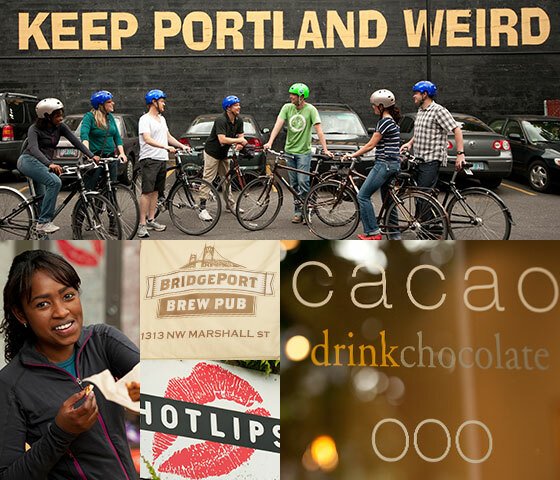 Our guides are super knowledgeable about all of Portland’s hot spots and how to get there safely by bike. Have an idea? Just give us a call and we will make every effort to put a smile on your face. We love to take groups out for a special time. 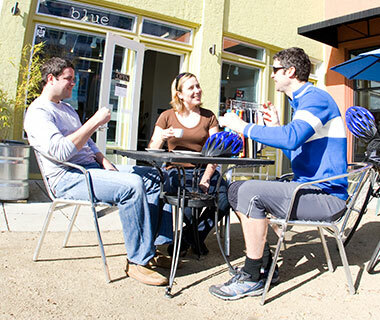 There is no reason your next business, social or any group meeting cannot include a group ride….